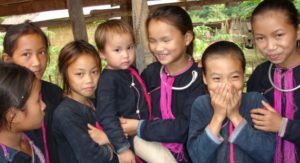 Lao PDR will test a new cross-cutting and evidence-based approach to reducing stunting in four northern provinces, with support from the World Bank. Representatives from the Ministries of Planning and Investment, Agriculture, Public Works and Transport, and Health, together with the World Bank, met today to discuss this strategy, which targets not only healthcare, but also diversified food production, improved hygiene, and social welfare programs. The World Bank will adjust ongoing projects and will design new initiatives in health, social protection, water and sanitation and hygiene, and agriculture, to provide targeted, long-term support to the same households and villages. This multi-sectoral strategy will be initiated in four northern provinces with high rates of malnutrition: Xieng Khouang, Houaphan, Phongsaly, and Oudomxay. In some of these areas, stunting affects up to 54 percent of children under five. The initiative focuses on the first 1,000 days of life, which are the most critical for development. The new approach involves simultaneously engaging multiple sectors in the same locations to address both the immediate and underlying causes of stunting. Evidence from international experience suggests that thiscombined strategy can successfully tackle chronic malnutrition. Malnutrition is a critical issue hampering Lao PDR’s development. Nationally, stunting affects over one third of all children under the age of five. Severe malnourishment can hinder brain development, school performance, and eventual success finding employment, making it more likely for families to remain in poverty. The World Bank currently finances 16 projects in Lao PDR. Investing in people, including through reducing malnutrition, is one of the key areas of the World Bank’s Country Partnership Framework for the period 2017-2021.